Should you ever decide to elope instead of planning a traditional wedding, know now that that reaction – or some less direct variation thereof – will be more common than any other. “Congratulations!” comes in at a close second with “I thought you looked tanned…” in third place. Confession time: When I was in my mid-teens, I stockpiled copies of Martha Stewart Weddings. In fact, at one point I had created a binder divided by tabs for sections containing photos of wedding gowns, bridesmaid dresses, cakes, floral arrangements and checklists. I was that girl. The girl that dreamed of her one-day wedding. By the time I reached my early 20s, my tune changed and I instead fancied the idea of an elopement. The notion was part rebellion and part romantic and seemed like a sensible means to an end. I was no longer attracted to the idea of spending tens of thousands of dollars, sorting through and categorizing friends and family or being the centre of attention. For any would-be bride (or style savvy groom), Pinterest is a virtual galaxy of ideas so stunningly beautiful that they cannot be contained in the pages of any of Martha’s magazines. “Pinspiration” abounds, with unique twists on traditions and DIY ideas. A few months before J and I became engaged, Pinterest introduced the concept of private pinboards, so naturally I started plugging away at gowns, cakes and flowers that caught my starry eyes. By that time, I had a seedling of suspicion that J would propose sooner or later, after which I’d plan for us the most incredible, heartwarming, sparkly celebration imaginable. 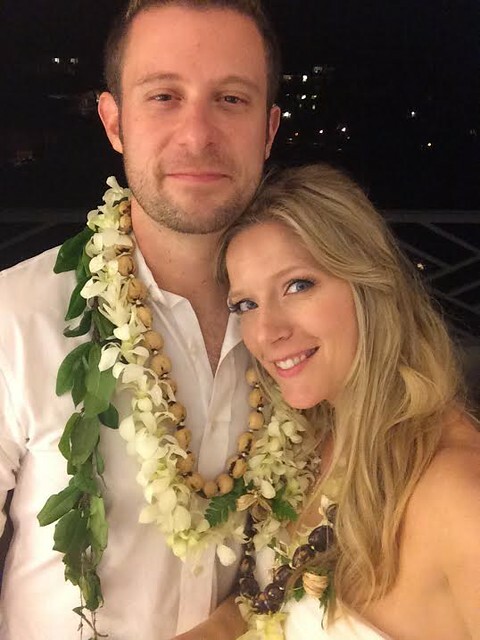 We became engaged in December 2012 on the island of Kauai and before we were wheels-up and headed back to Vancouver, I had already spread an inch-thick bridal magazine across my lap to dog-ear and tab as we made the trip home. The wedding of my our dreams had been set in motion. I can’t pinpoint the exact moment the proverbial lightbulb illuminated in my head, though I know it didn’t take long. Even before we were kissing under the mistletoe that Christmas, J and I were already asking each other what was most essential to both of us as individuals and collectively. That answer was simple: to be husband and wife. With that answer came the solution. The only reason I still had to hold a traditional wedding was that our families and friends would be there to witness our exchange of vows and help keep us accountable to those vows throughout the years. However, we knew that we had the love and support of the people in our lives, so making the decision to elope was an easy one. Don’t be fooled into thinking that planning an elopement is the easy way out – especially when you’re planning a destination elopement. It took J and I all of 3.2 seconds to decide that we wanted to return to the place we fell in love with, Hawaii. After we picked a date, I set out planning all of the basics. We needed to find out how and where to obtain a marriage license, not to mention find someone to conduct the ceremony. 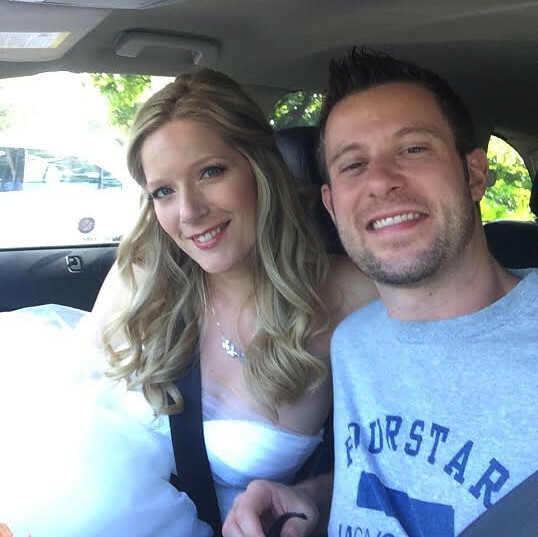 I’ve always placed high value on wedding photos (it’s the one aspect of the day – apart from the marriage – that will last), so we quickly booked a phenomenal photographer as well as a videographer to capture the ceremony for our respective parents’ sake. Planning is only one-half of the elopement challenge. The “omissions of truth,” as I like to call them, are something else altogether. Our elopement was going to be a true elopement in that no one would know that we were even going to visit Hawaii, let alone that we were getting married there. Part of the plan was to host a celebration reception the summer after our return, so when (constantly) asked “when’s your wedding?” I’d simply answer with “we’re planning to celebrate on July X, 2014.” See? Not an outright lie. Despite how slow it felt at the time, 2013 flew by. Exactly one year to the day we returned from Kauai, J and I boarded a plane to take us back to the island of Hawaii. Apart from putting the finishing touches on all the details, I needed to anticipate other factors. Since no one could know we were in Hawaii, I had to preschedule Tweets, Instagram photos and Facebook updates to give the illusion that we were still in Vancouver without actually stating that we were. So that my mom could still phone whenever she wanted to, I made sure to add a travel talk and data package to my phone. In retrospect, that was the hardest part of it all… the little white half-truths while we were in Hawaii. So did we pull it off? Seamlessly. J and I played by our own rules and did things exactly as we wanted to. Traditions only become traditions because they were ideal for someone at some point in time. 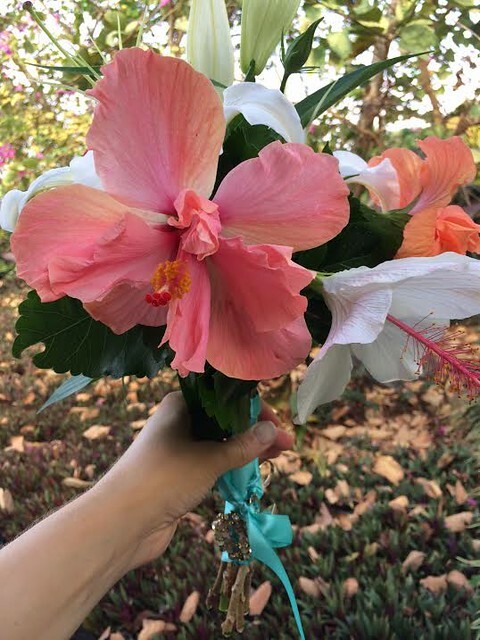 The morning of our wedding, we drank coffee together on the lanai before he helped me assemble my DIY wedding bouquet. After meeting our wedding photographer for a coffee at Island Lava Java, J dropped me off at Lush Hair Salon & Spa with my wedding garment bag in hand. 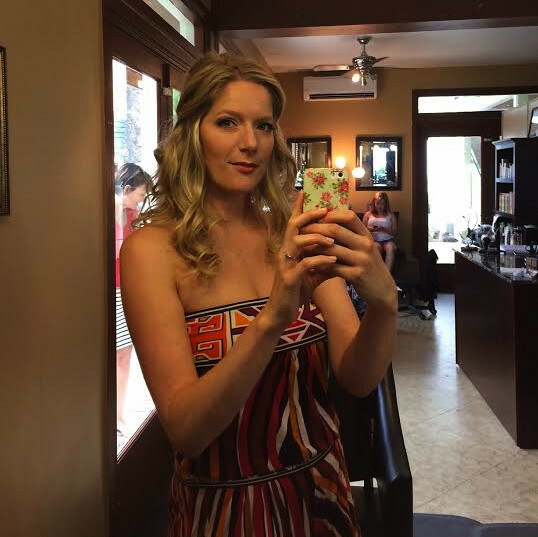 Hours later, with my hair coiffed perfectly, my make-up airbrushed on and my gown zipped, J got his first look at his bride in the courtyard at the Coconut Grove Marketplace in downtown Kona. Hand-in-hand, we stuffed me into our rental SUV (“It’s like trying to fit a cream puff through a key hole!“) and made our way to the beach to meet up with the rest of Team Wedding. One widely-shared piece of advice to anyone on their wedding day is to prepare for the inevitable hiccup. A car will break down, the bridesmaid dresses will be the wrong colour or your flower girl will have a temper tantrum as soon as the processional starts. I can honestly say that we were incredibly lucky because our entire day went off without a hitch. The beach was deserted save for a few sea turtles, the sun was shining but the air was comfortably warm and the ceremony itself was incredibly beautiful. As we popped the cork on our bubbly that night in our hotel suite, J and I felt nothing but gratitude and an overwhelming sense of peace in that we did what was best for us and for our relationship. There’s something thrilling about knowing that you’ve escaped the everyday, that you’re thousands of miles away from anywhere and anyone that knows you and that you’ve just taken a huge step into something brand new. 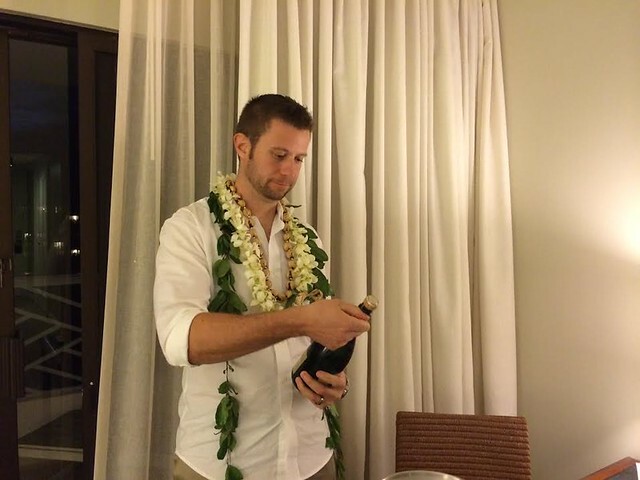 Following the ceremony, we spent two more weeks in Hawaii enjoying an extended honeymoon before we needed to return to Canada and drop the news on our families. There were a lot of happy tears and congratulations on both sides, and our families seemed genuinely happy for us. Having their fierce support and deep love was simply the icing on our non-existent wedding cake. If we had to do it all over again, there’s not a thing we would change. And for the record, no – I’m not pregnant. Congratulations!! What a wonderful, romantic, heartwarming story! What wonderful memories for the two of you to share for the rest of your lives. Amazing! That is true love, so very happy for you both!! Good for you for following your dreams and your heart. I wish you all the best!